All the wiring was surface run. Wires were mounted to the wall with ty-wraps that have screw holes in them (staples are not a good means to mount data cable). 12 port patch panel has 10 runs to 5 double CAT5 surface mount biscuit jacks and 2 runs from this segment of the network down to the basement where the main network is located. Two runs were made from this segment of the network to the main router/switch because the length (this is located on the 3rd floor) as well as if they ever decide to have 2 physically separated networks for the VoIP phones and PCs. 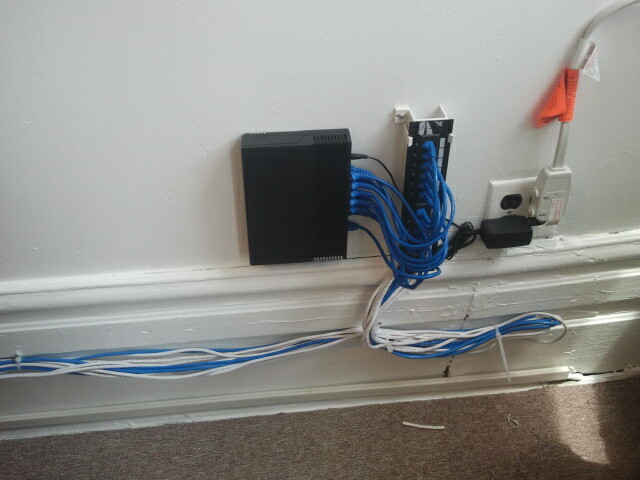 16 port switch, connected with the 12 port panel with 1 foot patch cords. The reason for the CAT5 cabling coming past the panel and then back is to allow extra wire for any future repairs of the terminations.